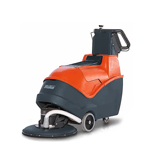 Looking for short or long term rental on a quality sweeper or scrubber? Please fill in the form here or call us on 1800 257 221. Quick availability for short term rental of cleaning equipment (1 day to 3 month periods). We have an extensive fleet of walk behind and ride-on equipment available for your cleaning needs. Call us for availability and rental rates Australia wide. Rental is fully tax deductible, no capital outlay. Peace of mind - we look after the maintenance. Buy the existing equipment, return or update to the current model at the end of the term. One of our application and industry specialists will contact you to help select the right piece equipment and the right rental package.